Hello, lovelies~ Not a beauty related post today, but rather a story of my life, if you are interested. Tee hee. I went to the BOO! Bazaar with my bestie, Neng, and her friend, Jeane. 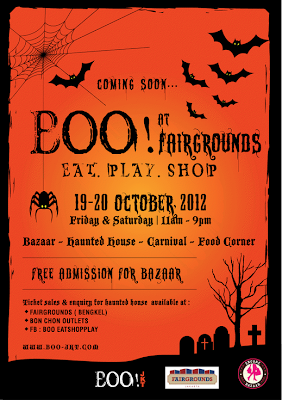 It was held for two days, 19-20 October, at the Fairground, SCBD, Jakarta. We reached quite early around 12.30-ish and met up with Jeane at the entrace of the Bazaar. We were welcomed by the iconic fruit of October or Halloween, the pumpkin. The entrance to the Bazaar is free, which is great because if you're just there to browse around, there won't be any need to pay for admission. Inside the bazaar, I can already see lots of vendor selling everything that a girl would want. We wanted to eat first before we took a stroll around the bazaar, but we passed by a couple of vendors that sell fashion items and accessories. I found a cute ring here, but I didn't buy it, huee.. Right after that, we explored every inch of the bazaar, hoping to find something good. Neng and Jeane bought a few items, while I didn't. I was already out of my budget this month in shopping, so I held back and didn't buy anything. They have baby stuff as well! Before we go home, we decided to take a look at the other food area, which sells Bon Chon Chicken. Neng has been yapping about this specific food since 2 or 3 days ago to me. It was delicious, the spice is just right, although the fries was cold, but it was good. Bon Chon chicken, which is surprisingly good! All in all, it was a fun and enjoyable day, especially the part with the fortune teller. It was finally nice to meet you, Jeane.